for the newborn baby to develop correctly, to comply with the achievement tables and expectations, to roll over on time, to crawl in the right way, and to stand up at the right time. And heaven forbid, they shouldn’t miss out on any stage, or be late in getting to a stage. There are quite a few accessories and exercises meant to help babies develop at the right pace, and motor development is certainly vital. But besides all these, our children are surrounded from birth with countless stimuli – which despite the best intentions, don’t always create the best results. 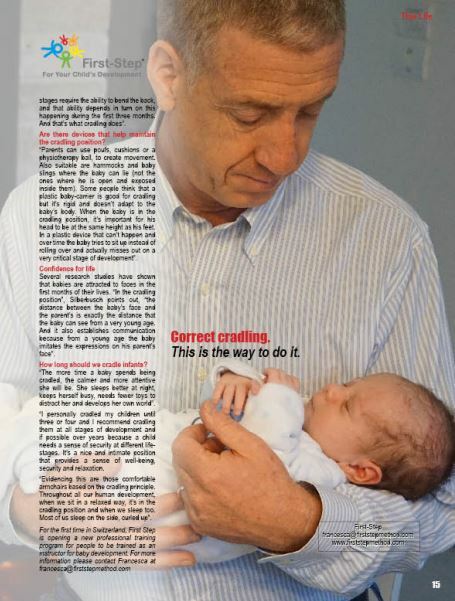 Shai Silberbusch, Founder of First Step method, mentions the one thing which can encourage the child’s development in the best way possible – cradling. For many years, Silberbusch has been teaching that position to the young mothers who come to him with babies just a few days old. Cradling is at the foundation of his method, the First Step Method. “It’s more than a recommended position”, he emphasises, “but a vital and critical position for the baby’s proper development”. In the cradling position, the baby lies in the parent’s arms, with one of the parent’s hands positioned under the baby’s head and holding her elbow, and the other hand is under the baby’s knees, supporting the pelvis. Silberbusch says that if parents start cradling soon after the birth, problems are unlikely to happen and the baby adapts with pleasure to the position. Most parents start cradling when the baby is around three months old – and then the baby may object. “We have to bear in mind that cradling is hard for some babies” says Silberbusch, “many mothers tell me that the child doesn’t like it, and resists it, but I believe the mothers are mistaken. Perhaps the infants are simply unused to it. Quite a few mothers stop cradling, saying: ‘my baby doesn’t like this position, but never mind’. But that’s a wrong move, because if the baby objects to cradling, it causes harm to the next stages of motor development. So it’s important to insist and teach parents how to encourage the baby to want to be cradled”. But all children eventually roll over, even those who were never cradled for a minute. So why is it so important? How is cradling contributory and vital for development? “Firstly we need to remember that the baby was born in the cradling position, physiologically curved, the way it lived for nine months. That was its only option for life in the womb. When the baby enters the world, his body should stay in that position which is familiar to him from the womb. It’s a position that creates security. The problem is that most parents are unaware of the baby’s profound need, and lay him on his back, with gravity pressing from above. Gradually, it forces the baby to develop. When we place a newborn on her tummy we see that she sleeps in a curved way – and that’s okay, even excellent”. “Right. And to solve that issue, we can place the baby on her back on cradling surfaces – like a pillow, a feather blanket, or a hammock, even for night-time sleeping”. Silberbusch says that – beyond normative motor development – cradling has other advantages. For example it gives children the opportunity to gradually enter the world outside the womb. One problem, he says, “is that the baby transitions from the quiet, calm environment of the womb, to an environment that’s noisier and full of stimuli. And if that transition doesn’t happen in stages, it can cause problems for the infant”. “Problems like prolonged crying, nervousness, agitation, sleep problems, pain, alarm, and sometimes apathy. For some infants, this situation causes them to become slightly detached. Think about it, from the moment of birth the baby’s is placed on his back with his arms spread out, usually to the sides, and is exposed to the world. From a safe protected world he enters a very different one, and the behaviours I mentioned before create a less healthy way of coping with the extreme change”. And what does cradling actually do? “Cradling lets us give the baby a gradual, secure introduction to the world. A sense of security is important throughout her entire development. For a six-month-old it’s also important to feel safe and relaxed in her parents’ arms”. That’s true, but why do babies feel secure in that specific position? “In the cradling position, the baby is totally relaxed – all his muscles are relaxed. In any other position, some of his muscles must work in order to stabilise him. But in the cradling position he relaxes completely and in fact experiences a floating sensation, like floating in the sea, or lying in a hammock. When the baby relaxes his hold, he generally falls asleep. Cradling should always be accompanied by another sensory experience, like movement and the parent’s voice. Simply cradling the baby isn’t enough, and the parent must move with him and talk to him; through all those experiences the infant develops his connection to himself”. “The baby is exposed to countless stimuli that rise to the surface in the first months of his life surface. During movement in the cradling position, we help the baby to enter into himself, detach himself from all the stimuli outside, and to develop his inner world. We give him the opportunity to discover his hands, to put them in his mouth, to learn how to relax himself alone. And that’s a terrific gift”. “When we cradle a baby, the baby’s hands have to be close to the mid-line of the body, and should still remain free. In this situation, the baby’s hands generally encounter each other. Sometimes they reach the mouth, and this is the foundation from which the eye-hand develops – the basis for continued motor stages”. What happens to a baby who isn’t cradled? “When the baby’s body isn’t held in this position, he’s in a situation where his back tends to be straight, rigid, and upright. This hampers him from continuing to the next developmental stages, rolling over for example. To roll over, the baby’s body has to be soft, movement-led, and flexible. When the first months are spent on the back, the result is a rigid back which in turn makes it harder to roll over. And if there are difficulties in rolling over, the baby will find it hard to crawl, as well as the transition to sitting. When rolling over does happen it’s more rigid, and crawling is less organised, because the child uses his strength instead physical organisation. In fact all motor developmental stages require the ability to bend the back, and that ability depends in turn on this happening during the first three months. And that’s what cradling does”. Are there devices that help maintain the cradling position? “Parents can use poufs, cushions or a physio ball, to create movement. Also suitable are hammocks and baby slings where the baby can lie (not the ones where he is open and exposed inside them). Some people think that a plastic baby-carrier is good for cradling, but it’s rigid and doesn’t adapt to the baby’s body. When the baby is in the cradling position, it’s important for his head to be at the same height as his feet. In a plastic device that can’t happen and over time the baby tries to sit up instead of rolling over – and actually misses out on a very critical stage of development”. Several research studies have shown that babies are attracted to faces in the first months of their lives. “In the cradling position”, Silberbusch points out, “the distance between the baby’s face and the parent’s is exactly the distance that the baby can see from a very young age. And it also establishes communication, because from a young age the baby imitates the expressions on his parent’s face”. How long should we cradle infants? “The more time a baby spends being cradled, the calmer and more attentive she will be. She sleeps better at night, keeps herself busy, needs fewer toys to distract her, and develops her own world”. “I personally cradled my children until three or four , and I recommend cradling them at all stages of development and if possible over years – because a child needs a sense of security at different life-stages. It’s a nice and intimate position that provides a sense of well-being, security, and relaxation. “Evidencing this are those comfortable armchairs based on the cradling principle. Throughout all our human development, when we sit in a relaxed way it’s in the cradling position, and when we sleep too. Most of us sleep on the side, curled up”.